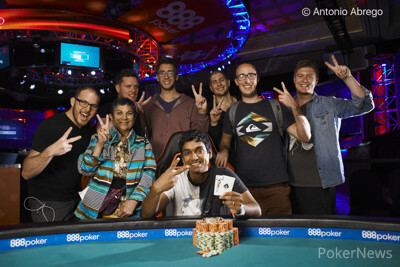 Upeshka De Silva won WSOP Event #3: $3,000 No-Limit Hold'em Shootout for $229,923, beating a field of 369 players to win his second gold bracelet. In the final hand, De Silva and Louis Helm got all the chips in preflop. De Silva had a dominating lead with his ace-jack against Helm's ace-eight, and his hand was still best on the river. The champion's latest WSOP win brings his live earnings to over $1,779,000. While he pocketed almost a quarter of a million dollars on Saturday, his biggest career cash is still from 2015 when he won his first bracelet in Event #45: $1,500 No-Limit Hold'em for $424,577. De Silva explained how he almost didn't make it in time to register for this event because his flight was delayed. He ended up biting the bullet and paid three times the price for a flight with another airline and made it just in time. "I told my friends before I won my first bracelet that I was going to win two, so I don't know if that means I'm capped now," he laughed. When asked about Helm's game, he said, "Louis played very well. He played a very good limp-re-raise all-in strategy against me. I kept trying to isolate him but he just kept going all in." De Silva went on to explain how he wanted to play small ball and chip away at him. "I felt like my heads-up game was a little bit better so I decided to take a more low-variance style, grind him down." While De Silva seems to be on cloud nine after winning yet another bracelet, he is slated to have an even better year, as he is set to get married. For the rest of 2017, De Silva plans on continuing to crush this series, travel to the biggest stops of the year, and fit in some time to get hitched while he's at it. 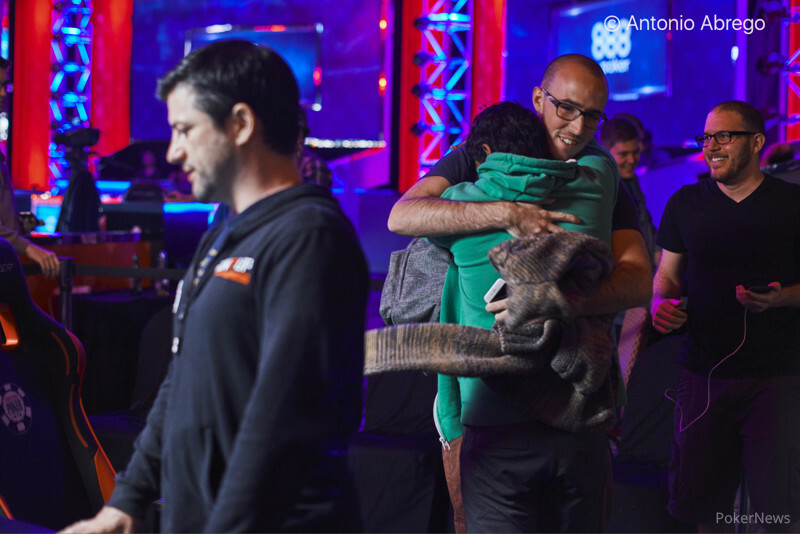 Although all 10 players began the final table with even stacks due to the shootout format, it wasn't long before the action took off, big pots became the norm, and the bustouts began. First to hit the rail was Taylor Paur when he ran king-ten into Mark McMillan's king-jack. Next was bracelet winner Jean Gaspard, who got all his chips in preflop with ace-king suited against Helm, who held queen-four. Helm flopped a queen and went runner-runner to make a wheel and eliminate Gaspard in ninth place. Shortly thereafter, McMillin became the eighth-place finisher when his queens ran into Jan Schwippert's aces. Next, John Richards busted in seventh place when he lost a coin flip with pocket sixes against Linglin Zeng's ace-jack. Casey Carroll fell in sixth place when he got his stack in the middle preflop holding king-queen and failed to improve against Helm's ace-jack. The fifth-place finisher was Olivier Busquet, who also lost a coin flip against Helm when his pocket tens didn't outrun Helm's ace-queen. 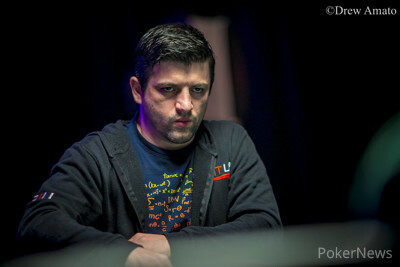 Helm continued to accumulate chips when he busted Schwippert in fourth place. Schwippert shoved from the button with a naked ace and didn't improve against Helm's pocket nines. On the very next hand, Linglin Zeng was eliminated when her ace-ten suited ran into pocket nines, but this time, it was the eventual champion De Silva who sent one to the cashier. After that, De Silva and Helm were heads-up, and what happened next is history. Some of the notable players who made the money in this event but fell short of the final table included Dominik Nitsche, Kyle Bowker, Barry Greenstein, Jared Jaffee, John Racener, Andre Akkari, Jake Schwartz, Jean-Robert Bellande, Jean-Pascal Savard, Aaron Mermelstein, James Obst, and Matt Glantz. All of these players took home a min-cash worth $6,407. While there were plenty of notables that made it through, some of the familiar faces to fall short of the money included Andy Frankenberger, Sorel Mizzi, Humberto Brenes, Simon Deadman, Kenny Hallaert, Cary Katz, Antonio Esfandiari, Kitty Kuo, Chris Moorman, Brian Rast, Anthony Zinno, Niall Farrell, David Benyamine, Michael Mizrachi, Mike Sexton, Liv Boeree, and Mike Leah. Hand #159: Louis Helm called from the button, Upeshka De Silva raised to 200,000 from the big blind, and Helm moved all-in for 1,950,000. De Silva asked, "Do you want me to call you?" and went into the tank for about 30 seconds. "You seem strong for some reason," he said. Ultimately, De Silva called, and the two players tabled their hands. De Silva had the lead and Helm needed to improve to double up. The board ran out , and De Silva won the pot with a pair of jacks to eliminate Helm and take the title. Hand #153: LouisHelm limped in, and Upeshka De Silva checked. The flop came , and both players checked to the turn, which was the . De Silva bet 50,000 and Helm called. The river was the , and both players checked. De Silva tabled , and Helm showed for the winner. Hand #154: De Silva raised to 120,000 and Helm folded. Hand #155: Helm limped in and De Silva checked. The flop came and De Silva checked. Helm bet 50,000, and De Silva raised to 170,000. Helm folded. Hand #156: De Silva raised to 120,000, and Helm went all in. De Silva folded. Hand #157: Helm limped in, De Silva raised to 165,000, and Helm moved all in. De Silva folded. Hand #158: De Silva raised to 120,000 and Helm folded. Hand #146: Upeshka De Silva limped in and Louis Helm checked. The flop came , and both players checked to the turn, which was the . Helm bet 85,000 and De Silva folded. Hand #147: De Silva got a walk. Hand #148: De Silva raised to 120,000, and Helm moved all in. De Silva folded. Hand #149: De Silva got a walk. Hand #150: De Silva raised to 120,000 and Helm folded. Hand #151: Helm limped, and De Silva raised to 165,000. Helm moved all in and De Silva folded. Hand #152: De Silva raised to 120,000 and got no action. Hand #139: Helm called from the button, De Silva raised to 160,000 from the big blind, Helm moved all-in, and De Silva folded. Hand #140: De Silva called from the button, Helm raised to 200,000 from the big blind, and De Silva called. The flop fell and Helm checked. De Silva bet 135,000 and Helm called. The turn brought the and both players checked. The river was the and Helm checked. De Silva bet 245,000, and after a few moments of thought, Helm called. De Silva tabled for a pair of tens, which was good enough to win the pot. Hand #141: De Silva got a walk in the big blind. Hand #142: De Silva called from the button, Helm raised to 200,000 from the big blind, and De Silva called. The turn brought the , Helm bet 260,000, and De Silva folded. Hand #143: Helm called from the button, and De Silva checked his option. The flop came , and both players checked. The turn was the , and both players checked again. The river brought the , De Silva bet 60,000, and Helm folded. Hand #144: De Silva called from the button, and Helm checked his option. The flop fell and Helm checked. De Silva bet 50,000 and Helm called. The turn brought the , Helm bet 110,000, and De Silva called. The river was the , Helm bet 340,000, and De Silva folded. Hand #145: Helm called from the button, De Silva raised to 160,000 from the big blind, and Helm folded. Hand #134: Upeshka De Silva raised to 120,000 on the button, and Louis Helm moved all in. De Silva folded. Hand #135: De Silva got a walk. Hand #136: De Silva limped in, and Helm raised to 200,000. De Silva folded. Hand #137: Helm limped in, and De Silva checked his option. The flop came , and both players checked to the turn, which was the . De Silva check-folded to a bet of 85,000 from Helm. Hand #138: De Silva limped in, and Helm checked. The flop came and both players checked to the turn. Helm bet 90,000, and De Silva raised to 230,000. Helm folded. Phil Hellmuth Lights His Shoes on Fire? The two remaining players are on a 60-minute dinner break. Play will resume at approximately 7:32 p.m.
Upeshka De Silva currently leads with 3,910,000, and Louis Helm sits on 1,590,000.